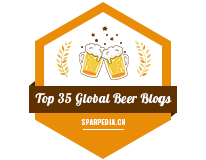 I'm having a hard time catching up to beer reviews... and quite a few of them are Beau's reviews, they keep coming out with new beers that I absolutely NEED to try! 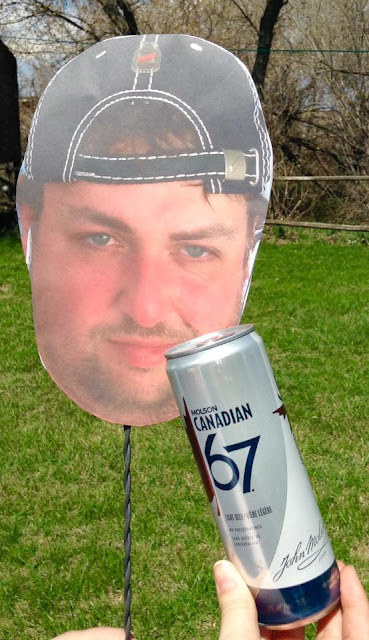 Beau's Channel Ocho is part of the brewery's 2018 Winter Mix Pack. 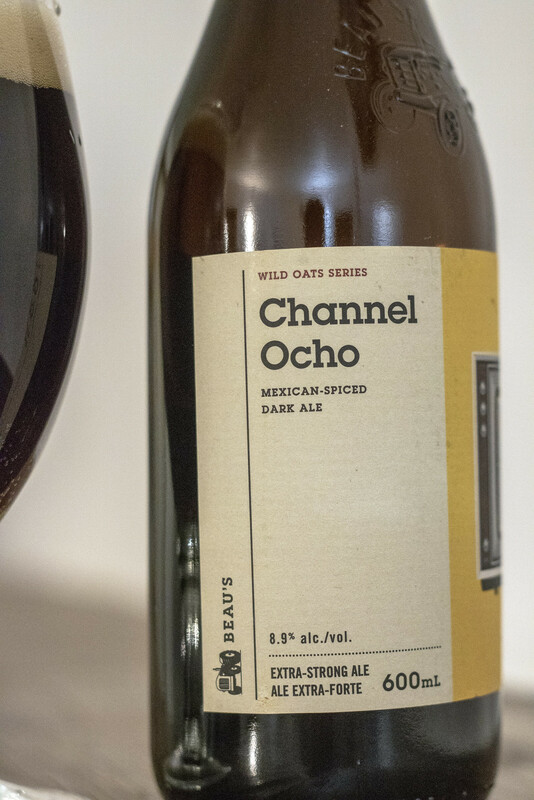 Channel Ocho is a creative riff on a spiced winter ale inspired by Mexican hot chocolate. 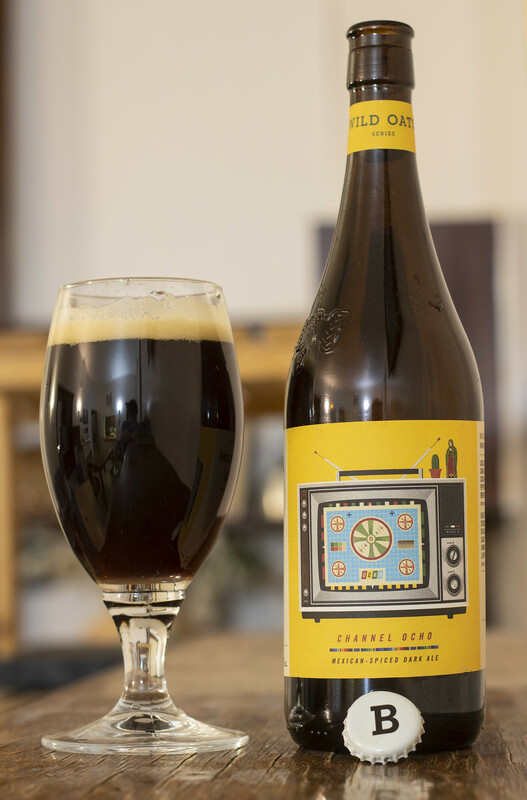 Channel Ocho pours a dark mahogany with spicy and earthy aromas, and hints of stone fruits and banana. I grew up with farmervision in rural Western Manitoba and I'd be lucky with eight TV channels.. instead, we had 4 channels... FIVE if we were lucky (a very fuzzy feed from North Dakota or Saskatchewan).. so I'm jealous at channel Eight. Appearance: Pours a rich dark brown body with a bit of a cherrywood red hue to it. The head is yellowish-beige and only a whole finger's worth, diminishes gently and leaves behind a good amount of stripy lacing on the glass. ..Once my senses are back to normal, I get notes of milk chocolate, a hint of coffee and a definite peppery spiciness that definitely wasn't from the chicken bites.. it's a mild chipotle/spicy pepper aroma (maybe cayenne?).. but after looking at the ingredients list, it's chipotle. There's also a hint of brown sugar and nutmeg in there - I think this would be amazing as part of a nice spicy chili (which I'd eat if it didn't have chunks of onion or beans in it). Taste: There's sweet notes of chocolate and brown sugar popping up right at the beginning, but then you get a mild heat presence of the chipotle pepper popping up that gives off a very subtle amount of heat on my tongue and lips. There's also notes of cinnamon/nutmeg, a bit of roasted coffee presence to give it a bit of a bitterness to it.